When building a company there are more nights than I care to remember when I lie awake wondering how this or that will resolve itself. Or be resolved. I learned early on that attempting to deal with issues as I perceived them in the dark hours was never a clever thing to do – some things just never get a proper perspective without the sun being up. That perspective usually presents problems in a significantly reduced magntude. (Mind you there are some sparks of inspiration that happen in the middle of the night as well and some answers have hurredly been written down before I drop back to sleep – and potential forgetfulness). 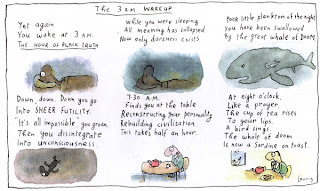 So I laughed out loud when I saw this from cartoonist Leunig. He hits the nail on the head nicely. I can relate to his whale of the dark hours being the sardine on toast at breakfast all too well. Sharing something here from my Christmas Day. 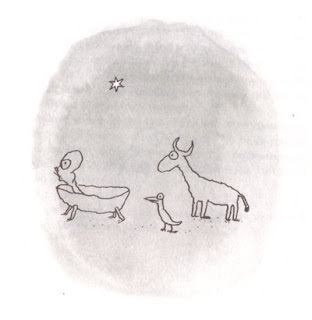 By Leunig. A brilliant cartoonist, satirist, and social commentator. His website is worth a visit.